October 31st, which is the highest and holiest night of sacrifice for the secret society of the Illuminati. Halloween was originally known as "All Hallow's Eve", and began in the 7th Century A.D. It was initially celebrated on May 13th as a night to celebrate the memories of deceased saints and martyrs. The date was then changed to November 1st, which marked the change from summer to fall, and removed the stigma of the holiday from being so close to Beltaine. Legends began to be circulated of the ghosts of departed ones revisiting their former homes to warm themselves by the fire, and roaming the countryside retrieving offerings of food and drink, supplied by living family members. But it was rumored that darker forces roamed the night as well; demons, goblins, and witches, all haunting the night with acts of mischief... i.e., "the trick". But real witches also roamed the night, acting out their ritual dances around fires, while the devil himself played music for them. Modern witches and wicca practice similar Halloween rituals, calling on earth's spirits and goddesses to visit their circles of power. In an upcoming book by Tom Horn and Josh Peck, entitled Abaddon Ascending: The Ancient Conspiracy at the Center of CERN's Most Secretive Mission, the authors consider, among other topics, the goddess Hecate, the Titan Earth mother of the wizards and witches, who illustrates perhaps better than any other ancient goddess the connection between Wicca, the Celtic Halloween traditions, and the realm of evil supernaturalism. Hecate may be considered the original witch of Halloween, and as the dark goddess of witchcraft, Hecate, like Isis, was worshiped with impure rites and magical incantations. Her name was probably derived from the ancient Egyptian word Heka, meaning "sorcery" or "magical," which may explain her association with the Egyptian frog goddess of the same name. That is probably where we get the legendary tales associating frogs with witchcraft, and the witch's various potions of frog-wart. And here is an interesting fact I bet you didn't know: Because her devotees practiced such magic wherever three paths joined, Hecate was known by the Romans as Trivia ("tri"-three; and "via"-roads). Later, when the Latin church fathers compared the magic of the goddess Trivia with the power of the Gospel, they found it to be inferior, and thus the pursuit of Hecate's knowledge became known as "Trivial Pursuit," or inconsequential. But the fact remained that Hecate's followers sincerely believed in and feared her magic, and her presence was legendary. 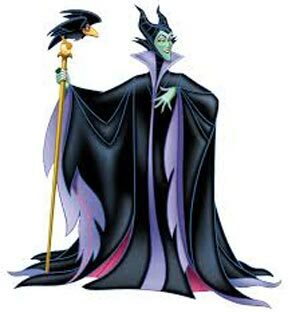 This was primarily due to her role as the sorceress of the afterlife. But true believers also feared Hecate's ability to afflict the mind with madness, as well as her influence over night creatures. She was thought to govern haunted places where evil or murderous activity had occurred. Such areas where violence or lechery had a history were believed to be magnets of malevolent spirits, something like "haunted houses," and if one wanted to get along with the resident apparitions they needed to make oblations to the ruler of the darkness—Hecate. Hecate's most familiar companion was the night owl, who announced the acceptance of the oblations. And those who gathered on the eve of the full moon perceived the spooky sound of the creature as a good omen. Statues of the goddess bearing the triple-face of a dog, a snake, and a horse overshadowed the dark rituals when they were performed at the crossing of three roads. At midnight, Hecate's devotees left food offerings at the intersection for the goddess ("Hecate's Supper") and, once deposited, quickly exited without turning around or looking back. Sometimes the offerings consisted of honey cakes and chicken hearts. At other time's puppies, honey and female black lambs were slaughtered for the goddess and her followers. These followers were women who were deformed by a curse placed on them, and vicious owl-like affiliates of Hecate, who flew through the night feeding on bodies of unattended babies. 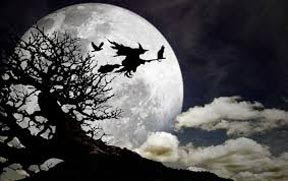 During the day these followers appeared as simple old women, and such may account for the history of Halloween's flying witches. 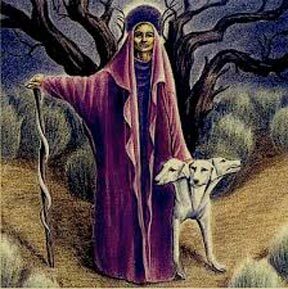 The same followers hid amidst the leaves of the trees during the annual festival of Hecate, held on August 13, when Hecate's followers offered up the highest praise of the goddess. Hecate's devotees celebrated such festivals by communing with the tree spirits—(Earth spirits, including Hecate, were thought to inhabit trees)—and summoned the souls of the dead from the mouths of nearby caves. Hecate was known by a variety of names: "the one before the gate," a role in which she guarded the entrances of homes and temples from nefarious outside evils (talk about Satan casting out Satan! ); and "the one who leads," as in the underworld guide of Persephone and of those who inhabit graveyards. Finally, she was known as Hecate-Phosphoros, "the light bearer," her most sacred title and one that recalls another powerful underworld spirit, Satan, whose original name was Lucifer ("the light bearer"). It was nevertheless her role as the feminist Earth-goddess-spirit Hecate-Chthonia that popularized her divinity and commanded reverence from among the common people. 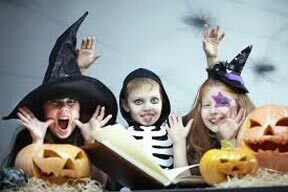 • People visiting neighborhood homes on Halloween night represent the dead in search of food (the treat). • Masks of devils and hobgoblins represent evil spirits seeking mischief (the trick). • Those who pass out candy represent the homes visited by the dead, or may also represent worried individuals seeking to appease Hecate and other nighttime terrors. • The Jack-O-Lantern (will-o-the-wisp, fox fire, fairy fire, etc.) is, according to some histories, a wandering soul stuck between heaven and hell. Others claim the Druids left Jack-O-Lanterns on doorsteps to ward off evil spirits. Another legend concerns a drunk named Jack who made a deal with the devil. Each claims to be the true origin of the Jack-O-Lantern myth. And in case you think this is all just a bunch of harmless folklore, I want you to consider this .... not long ago some 300 exorcists flocked to Poland for a week-long congress to examine the current fashion for Halloween-themed monsters like werewolves and vampires the world-over, and the apparent connection between this fascination and a surge in demonic possession. Is it possible that the world is experiencing an explosion of ancient occultism combined with wicked fascination for ghosts and all things paranormal? Those who monitor social trends now say that Halloween is the second most popular holiday, surpassed only by Christmas; itself full of pagan symbolism. I don't think we can ignore that in the United States alone, there are as many as 8 million practitioners of witchcraft. On college and high school campuses vampires, werewolves, and other "creatures of the night" are esteemed as objects of desire and idolized by young men and women who view them as cult icons of envious mystical power. (The popularity of the Twilight movie franchise exhibits this dangerous fascination). Almost daily we read how Satanism is spreading to public schoolyards and elementary after-school clubs; city council meetings are being opened with invocations to Satan; and even church goers are being enchanted by the darkness. It is imperative that we understand that the Mass Media, including the Internet, television, film, radio, and other communications systems, have traded Bela-Lugosi-like vampires of former years and silly Abbott and Costello's Frankensteins and Mummies, (which could be vanquished with Christian symbols), for monsters of profound demonic character depicted as impervious to Christ's power. As a result, today's youth have exchanged yesterday's pigtails and pop-guns for pentagrams and blood covenants aligned with forces far stronger than former generations could have imagined.... and forces that they are ill-informed to withstand. It is no stretch of the imagination to suggest this is one of the signs that this age is under demonic influence. If we could see through the veil into the supernatural realm, we would find a world alive with good against evil; a place where the ultimate prize is the soul of this generation and where legions war for control of its cities and people. Yet we continue to think that celebrating Halloween is harmless, and we refuse to look beyond the veil to see the dark spiritual forces orchestrating their evil. I know that there will be those who think this is all exaggerated and nothing but old wives tales, or fanciful legends. But if you are willing to entertain the smallest possibility that there is any truth to these legends, then why would you partake in the celebration of such wickedness ... and worst of all, why subject a child to the influence of such dark forces. It's time to come out of our stupor and listen to the discerning spirit that God has given us. There's a reason these "legends" have existed for as long as they have, and it doesn't take much imagination to see that the forces behind them are gaining in power. Thanks to Charisma News and author Tom Horn for the research and the information regarding the history of Halloween and its pagan, demonic roots. You really broke this down nicely. Im sending it out to several who are on the verge of waking from the slumber and security of their mega church. This needs to be understood at the pulpit level and conveyed to the church masses but I know that will be a stretch. Thanks for the info and keep ringing that bell! I believe it is going to take all of us, as members of the remnant, to ring the bell and start waking our fellow Christians. Thanks for doing your part! "Ring the bell" What a way with words you have, Belle Ringer :-) LOL :-) Also, how rare it is to find someone who knows the name Tom Horn! So glad to find you, sister! God bless!